By Dave Id, via San Francisco Bay Area Indymedia. As U.S. congressional leaders are hashing out the next Farm Bill in the Senate — an event that occurs every five years — farmers, activists, food justice advocates, environmentalists and many others are hard at work trying to salvage conservation and alternative farming programs from budget cuts. The bill, in all likelihood, will further hand the food system over to industrial agriculture and food producers. It has sweeping implications across the globe, affecting domestic and global food assistance, farmer crop insurance, conservation programs, commodity subsidies, and more. In essence, the Farm Bill props up the industrial food system, even as it contains small programs that support alternative and organic agricultural practices. Last Sunday, when 200 people set out to grow food in the overgrown fields of the Gill Tract, a 10-acre agricultural lot in the East Bay neighborhood of Albany, Ca., owned by the University of California — and slotted for development — they were directly challenging the ethos of the industrial food system that the Farm Bill represents. 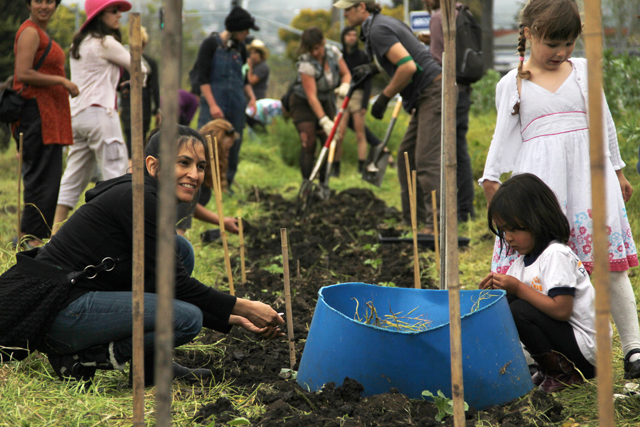 The plan for the action, dubbed “Occupy the Farm: Take Back the Gill Tract,” was to celebrate Earth Day by turning this piece of rich agricultural land into a vibrant urban farm. At the end of the day, 15,000 donated seedlings had been planted and an occupation was emerging. Fifty or so people — complete with tents, a kitchen and a composting toilet — stayed on to protect the hard work of all the volunteers, including Albany residents, Occupy Oakland activists, UC students and community organizers. The Gill Tract was once more than 100 acres but, thanks to encroaching commercial and residential development promoted by the university, very little of it remains. For more than 15 years, community organizers and citizens have tried to convince the university to preserve the land for agricultural purposes. According to Haddock, dialogue failed, so the farm occupation is their last-ditch effort to save one of the last pieces of good soil in the East Bay area. “We are at the end of a struggle,” said Haddock, hopefully. She explained that formal communication with UC authorities about the tract has not occurred, adding, “Our communication is our occupation.” Last Wednesday, though, UC officials visited the farm and released a media statement demanding that the protesters vacate the land, along with allegations that occupiers were unsanitary in their handling of human waste (referring to the composting toilet, which is a viable method of ecological sanitation used globally). Take Back the Tract is inviting neighbors and the public to see for themselves what is going on with a “Farmland is for Farming Family Weekend,” including tours, teach-ins, activities and work opportunities. We are reclaiming this land to grow healthy food to meet the needs of local communities. We envision a future of food sovereignty, in which our East Bay communities make use of available land — occupying it where necessary — for sustainable agriculture to meet local needs. [F]ood sovereignty demands local and democratic control over our public institutions. And instead of a historically and logistically impossible division of “government” on one side and “markets” on the other, food sovereignty promotes a market that is accountable and humane because it is built up from the lives and decisions of those who are affected by it. This may all sound very theoretical, but land occupations like the effort to Take Back the Tract make these ideas real, immediate, tangible, and imaginable. Anna Ghosh, communications manager with Food & Water Watch, works on advocating for a fair Farm Bill for consumers, farmers and the environment. According to Ghosh, what needs to change is who makes the rules that allow unchecked market consolidation by a small handful of corporations. Food & Water Watch publishes a useful primer on the Farm Bill and the corporate control of the food system. Confronting the kind of political power behind the tightly-controlled food system — which includes universities, corporations and the government — increasingly seems to require direct action tactics like occupation. The Gill Tract farmers and residents feel they know better than the UC Board of Regents what their Albany community needs: a farm. And those who work most closely with the land — the farmers, the ecologists, the conservationists — usually know best what the land needs: a better food system. Those who occupy are stickers. They believe if something is the right thing to do, they have every right to do it. This is this sort of attitude that will foster food sovereignty and transform the system from a centralized, industrial one into a localized, sustainable model for living communities, economies and ecosystems. The 2012 Farm Bill will not go far enough in supporting a democratic food system because those who write it don’t have ties to the land or the neighborhoods that will be most affected. “An economy genuinely local and neighborly,” declares Berry, echoing the vision of the Gill Tract farm, “offers to localities a measure of security that they cannot derive from a national or a global economy controlled by people who, by principle, have no local commitment.” Take Back the Tract seems like the perfect antidote. The location is just down the street from the Albany Bulb, another location that has its struggles to stay free.